Once a month I get together with other wine geeks as part of a bottle share–we pick a theme for the month and everyone brings a bottle on the theme to taste and discuss. It’s a great way to keep learning and it’s always a lot of fun. For a recent meeting we decided to tackle the idea of “Bargain Burgundy”–if such a thing even exists. We actually found quite a few gems, but Chablis particularly stood out as an area where one can still find bang for the buck in a region that generally tends to be pretty pricey. Chablis stands apart from the rest of Burgundy both in terms of geography and style. It’s further north than the rest of Burgundy’s wine growing areas and their winemaking style tends to reflect the more austere conditions. It gets pretty steely with lots of crisp, lip-puckering citrus notes and tons of minerality. 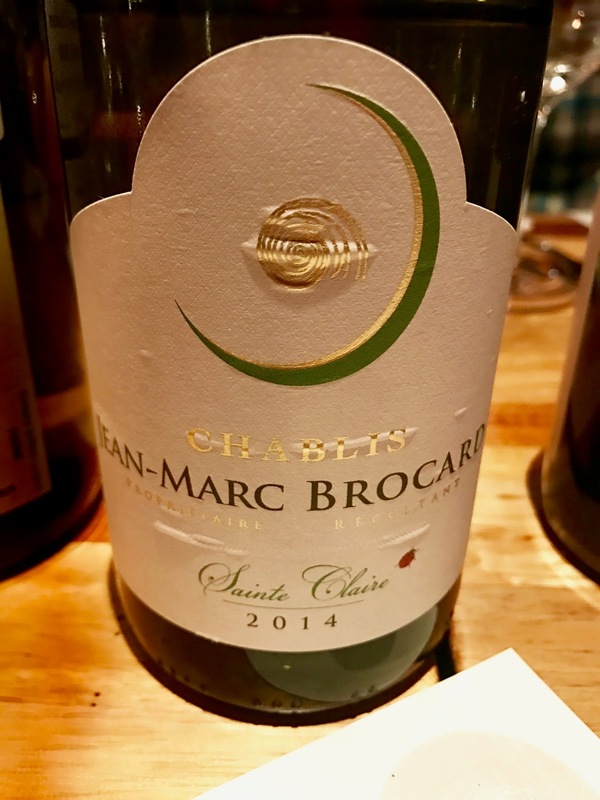 On the evening of this bottle share, the 2014 Jean-Marc Brocard Chablis Sainte Claire especially grabbed my attention. We happened to have two bottles from Jean-Marc Brocard in the lineup–the Saint Claire that retails in the low $20’s range, as well as a pricier Premier Cru cuvée. The Premier Cru showed more complexity, as might be expected, but I was really charmed by the Saint Claire and even more impressed by the degree of complexity it delivered at such a reasonable price point. I soon got my hands on another bottle–this time 2015–to cook to. I sat down with Greg (my husband and the photographer for these pics) to taste the wine and plan our dinner. The wine had bright lemon notes, gold and green apples, a hint of cream, light herbs, and salty sea minerals. It had a round mouthfeel with a sense of richness, but with a clean, chalky finish. I knew I wanted seafood with this wine–pretty classic for Chablis. (Oysters and Chablis are a famous pairing duo.) However, that richness made us crave something a little more opulent than a simple, clean seafood dish. There was a hint of Parmesan rind on the palate that was leading us to want to add some cheese to the mix. 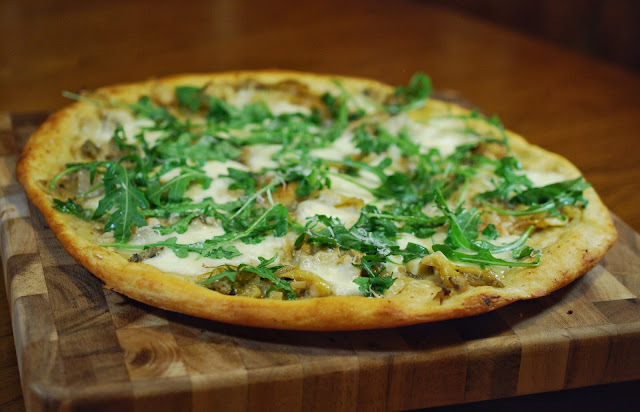 Greg thought back to the famous clam pizzas we had on a trip to New Haven and gave us the inspiration for this dish. 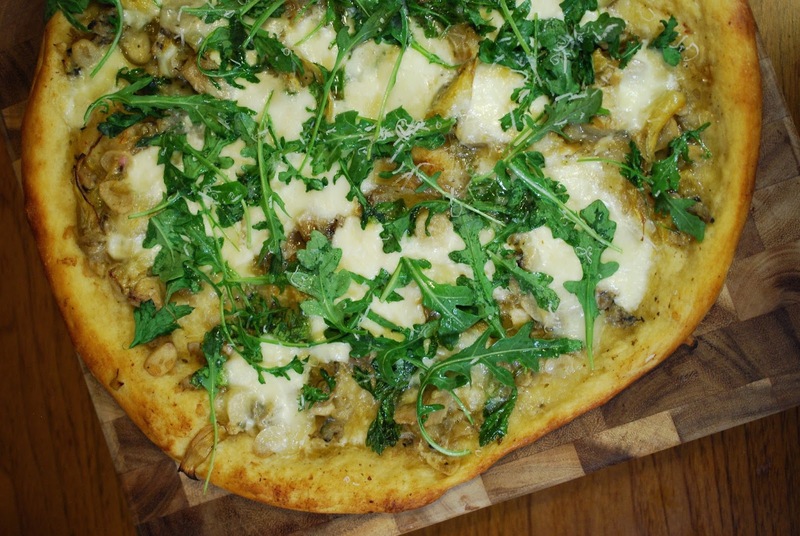 To save time, I made use of store-bought pizza dough–I was really happy with Whole Food’s version. That said, if you have a favorite recipe, certainly feel free to use it. I gave the dough a short blast in the oven on its own to crisp it up and help it stand up to all the liquid in the rest of the ingredients. Burrata’s silky creaminess added that luxurious note I was looking for. Buffalo mozzarella would definitely work here as well, and even standard mozzarella will do in a pinch. Given the herbal notes in the wine, I thought there was room for a little something green as well, so I added some marinated artichokes and finished it off with some parsley and a couple handfuls of arugula just before serving. We have been dreaming of this pizza since that night. It absolutely sung with wine and vice versa. As we’d hoped, the wine held up to the creamy cheese really well. The minerality in the wine was reflected in the food and the citrus in both really came out and kept out and kept everything refreshing. Chablis is famous for its Kimmeridgian clay–also found in Champagne and the Loire Valley. It’s a chalky marl and limestone soil that contains fossilized seashells leftover from a long-gone sea, and dates back to the Jurassic period. You’ll also find Portlandian soils, which are similar but from a younger period, with less limestone content and fewer fossilized shells. All the Premier and Grand Cru sites of Chablis are planted on Kimmeridgian soils, with other sites on proportionally less and more Portlandian. The Brocard Sainte Claire is reportedly on Kimmeridgian. The vines are 30 years old and on south-facing slopes, which give optimal exposure to sunlight and helps the grapes ripen–key in a cool climate in like Chablis. All farming is organic and/or biodynamic. The wine is fermented using native yeasts in stainless steel tanks. It’s then aged in tank for 9 months where it goes through malolactic fermentation. The Brocard winery is in the village of Préhy. The estate was started in 1973 on 1 hectare of land that Jean-Marc Brocard inherited for his father-in-law–it has grown considerably since then. Jean-Marc’s son Julien now shares the responsibilities and serves as CEO of the company. His daughter Celine was also part of the family operation until she decided to develop her own winemaking venture with her husband Frédéric Gueguen at Domaine Gueguen. The average price on this wine on Winesearcher.com is $20. I really think this is an Overachiever. We loved how this pair worked together, but I’m certain this would work well with a number of different dishes thanks to the freshness and the rounded mouthfeel. The extra texture makes me think that it has the ability to stand up to a decent array of dishes, including creamy cheeses like the burrata used here. As mentioned, seafood is a common pairing for Chablis and I’m sure this would work well with a wide selection, including meatier fish like tuna and salmon, as well as lighter poultry dishes. If you’re looking for other wine options, I’m sure you’ll do well with other Chardonnays, as long the oak isn’t overpowering. Texture from malo and/or lees complement the cheese, but I think too much oak spice would compete with the freshness of the lemons and the brininess of the clams. That’s the general balance to look for–a wine that is fresh and bright, but with enough texture and mouthfeel to work with the cheese. Let us know what other pairings work for you! 2. Roll out the pizza dough and place on a greased pizza ban, pizza stone, or cast iron pan. Brush with olive oil. (Tip: If you have seasoned oil left in the artichoke jar, you can use some of that as well.) Place in the oven and bake for 5 to 6 minutes, or until starting to crisp up. Set aside. Reduce the oven temperature to 450°F. 3. Melt butter/olive oil in a large pot. Add the shallots and a pinch of salt and sweat over medium heat until tender and translucent. 4. Add the garlic to the pot with the shallots. After a minute, add the lemon juice, a splash of white wine (if using–if not, you can use a little water, stock, or more lemon juice), the parsley stems, and the clams. Toss to combine, then cook for about 5 minutes or until the clams have opened up. 5. Transfer the clams to a separate bowl. Meanwhile, continue to cook the liquid until reduced to a syrupy consistency, then set aside off of the heat. As soon as the clams are cool enough to handle, scoop out the meat and finely chop. Combine with the cooking liquid. Discard the parsley stems. 6. Spread the clam mixture over the pizza crust. Sprinkle the parsley leaves over the clams. Carefully distribute pieces of the burrata over the pizza. (Note: Because the burrata was soft and somewhat delicate, I basically tore it apart by hand over the pizza so as not to loose any of that delicious cheese and cream on the cutting board.) Sprinkle the Parmesan cheese over the pizza as well. Place in the oven and bake for another 5 to 6 minutes until the crust is crispy and cheese is melted. 7. Remove from oven, cut into pieces, serve hot and enjoy! Over the weekend, I participated in a wonderful Twitter chat with the French Winophiles. (You can catch the chat on the third Saturday of every month, covering a different area of France each time by checking in on #Winophiles at 11 a.m EST/ 8 a.m. PST.) If you're interested in Burgundy, here are a few more wonderful posts from the group. Gwendolyn Lawrence Alley of Wine Predator takes on: "Journey to Burgundy Part 2"
Loved the 'geeky' details, but also the thoughtful analysis of the wine, and utterly practical conclusions about pairing options. A great entry point for anyone trying to open the door into Burgundy! Great post! Both the food and the wine sound delicious. Especially nice background on the wine and Chablis in general. Welcome to the group! 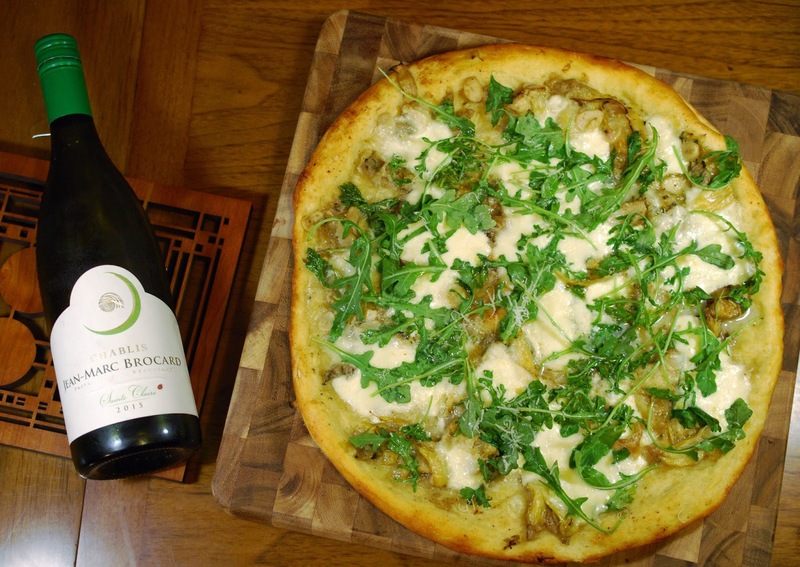 I love the creative pizza and I can see how the Chablis would be perfect! You are NOT messing around with that gorgeous pizza! I love how chatting about wine and food brings people together - friends, family, spouses... so much fun! Thanks for joining us this week and introducing us to your incredible ideas and perspectives. OH My YUM!!!! That pizza sounds out of this world and I know it was a perfect pairing.